Today I am just kicking back with my hubby and the dogs. We went to the woods, immediately got swarmed by mosquitoes and quickly got out of Dodge. We are now enjoying the cool indoors and the rest of our holiday weekend. So I was thinking about what I’d like to blog about today, and remembered a question Mary Buek asked in yesterday’s comments section regarding printing images onto paint skins, as outlined in the link that I gave. If you want a silkscreen effect, just create a high contrast black and white of your image in PhotoShop or other painting software, then remember to reverse it and print the mirror image of that onto the transfer sheet. Then cut out around the image that you want to transfer. Using a sheet of silicone treated release paper over the cutout so your iron won’t stick to the paint, (you can also use the shiny side of a sheet of paper that is left over from peel-off printer labels) iron the image down to the paint surface. Your iron doesn’t need to be as hot as it would have to be for a T-shirt transfer. Just set it on the synthetic setting. The transfer will grab right onto the paint or gloss medium. Let the transfer cool a little bit and see if it’s well adhered, then peel off the paper backing. Once your image is transfered to your liking, you can further integrate it into the paint surface by going over it with a coat of acrylic medium. 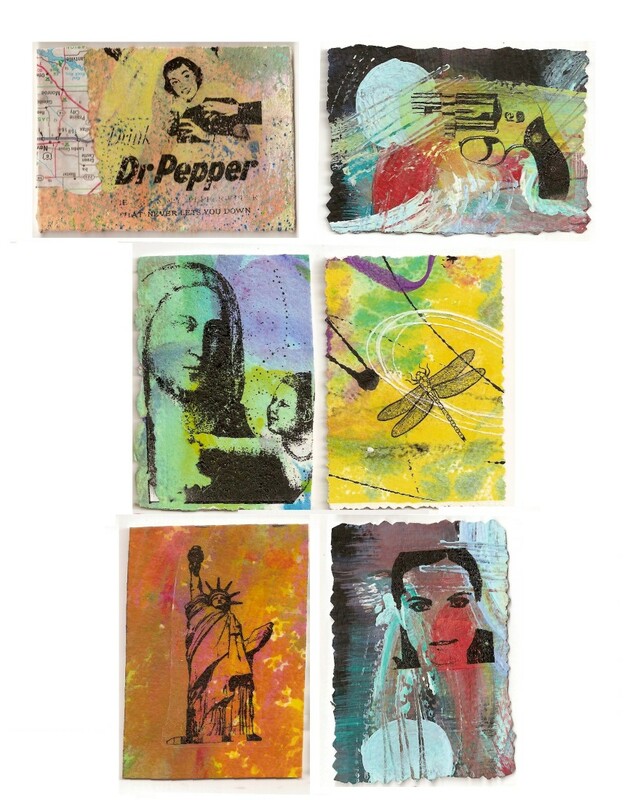 Above are are a few of my ACEO’s using this process. Just a little fun project. I hope you’ll try it and discover ways you can incorporate it into your art. I am so pleased to hear Gustav has not been as bad as warned; I hope the rest of the hurricane season passes well for you. Try this, Cath! It ought to work well with your art journaling.